The masterpiece of Steinbeck’s later years, East of Eden is a work in which Steinbeck created his most mesmerizing characters and explored his most enduring themes: the mystery of identity, the inexplicability of love, and the murderous consequences of love’s absence. Adapted for the 1955 film directed by Elia Kazan introducing James Dean and read by thousands as the book that brought Oprah’s Book Club back, East of Eden has remained vitally present in American culture for over half a century. After marriage and a move to Pacific Grove, he published two California books, The Pastures of Heaven (1932) and To a God Unknown (1933), and worked on short stories later collected in The Long Valley (1938). Popular success and financial security came only with Tortilla Flat (1935), stories about Monterey’s paisanos. 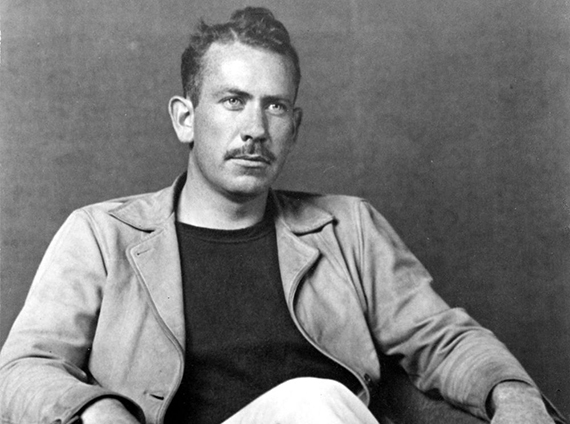 A ceaseless experimenter throughout his career, Steinbeck changed courses regularly. Three powerful novels of the late 1930s focused on the California laboring class: In Dubious Battle (1936), Of Mice and Men (1937), and the book considered by many his finest, The Grapes of Wrath (1939). The Grapes of Wrath won both the National Book Award and the Pulitzer Prize in 1939. Early in the 1940s, Steinbeck became a filmmaker with The Forgotten Village (1941) and a serious student of marine biology with Sea of Cortez (1941). He devoted his services to the war, writing Bombs Away (1942) and the controversial play-novelette The Moon is Down (1942). Cannery Row (1945), The Wayward Bus (1948), another experimental drama, Burning Bright(1950), and The Log from the Sea of Cortez (1951) preceded publication of the monumental East of Eden (1952), an ambitious saga of the Salinas Valley and his own family’s history. The last decades of his life were spent in New York City and Sag Harbor with his third wife, with whom he traveled widely. Later books include Sweet Thursday (1954), The Short Reign of Pippin IV: A Fabrication (1957), Once There Was a War (1958), The Winter of Our Discontent (1961), Travels with Charley in Search of America (1962), America and Americans (1966), and the posthumously published Journal of a Novel: The East of Eden Letters (1969), Viva Zapata! (1975), The Acts of King Arthur and His Noble Knights (1976), and Working Days: The Journals of The Grapes of Wrath (1989). Steinbeck received the Nobel Prize in Literature in 1962, and, in 1964, he was presented with the United States Medal of Freedom by President Lyndon B. Johnson. Steinbeck died in New York in 1968. Today, more than thirty years after his death, he remains one of America’s greatest writers and cultural figures.